Many Americans mark the new year with parties with friends and family. 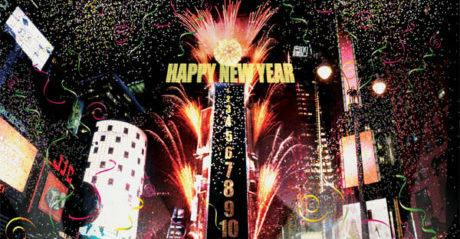 Celebrations generally go on past midnight into January 1 (New Year’s Day). Here’s a look at some New Year’s Eve traditions in America. An estimated 1 million people venture to Times Square in New York City to watch the New Year’s Eve Ball begin its descent a minute before midnight and to count down the final seconds before the new year begins. More than 1 billion people watch worldwide in a collective welcome to the new year as the illuminated Waterford crystal ball is lowered down a 21-meter pole. The ball weighs 5,400 kilograms and is 3.7 meters in diameter. Roughly translated as “For the sake of old times,” Americans, and many in the English-speaking world, sing this old Scottish ballad near the midnight hour. The song is about old friendships and acts of kindness in years past, and is widely used to mark endings, farewells and new beginnings. The tradition to kiss the first person you see at the stroke of midnight is rooted in German and English folklore. According to tradition, a favorable first encounter will set the tone for the rest of the year. Americans in the Southern states believe that eating black-eyed peas on New Year’s Day will bring them good luck and wealth. Many Southerners prepare the pea stew with a new coin and the person who receives it in their portion is considered to be extra lucky. Adding cooked greens (the color of U.S. money) to a black-eyed pea dish symbolizes a prosperous new year. Local fireworks displays, like the one above in San Francisco, are another favorite New Year’s Eve tradition. Other famous firework venues are in Dallas, Las Vegas and Walt Disney World In Orlando, Florida.